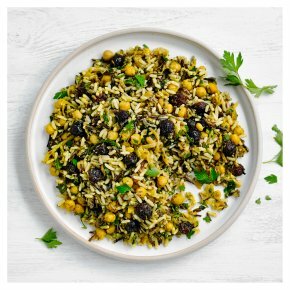 A Middle Eastern spiced salad with white and wild rice, roasted spiced chickpeas, juicy jumbo raisins, parsley and dill. A fresh and wholesome side salad full of flavour and texture. This salad goes well with all sorts of dishes, including grilled meats, halloumi cheese, roasted vegetables and assorted salads. Suitable for vegetarians and vegans. Consume within 3 days.